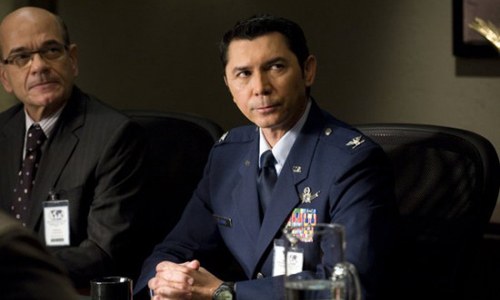 Cultural Wormhole: Stargate Universe - "Seizure"
Robert Picardo and Lou Diamond Phillips on 'Stargate Universe'. I've only seen about half of the first season of 'Stargate SG-1' and have never seen an episode of 'Stargate Atlantis', the installments of 'Stargate Universe' that either tie back to plot lines or characters from the two previous programs tend to be of less interest to me. Ever since the Lucian Alliance invaded the narrative of 'SGU', I've been fearing the injection of more Stargate lore to this show. I know it's silly, since this is part of a franchise. Still, 'SGU' started off and was promoted as being new viewer friendly and for the most part it has been so. Unfortunately, "Seizure" had too much of the old to win me over. Not only did "Seizure" have more of the "The Lucians are coming! The Lucians are coming!" spectre that has been hanging over the entire second season of 'SGU', but it also boasted two former cast members of 'Stargate Atlantis' in significant roles for half of the hour. I'm sure fans of the other two shows loved this, but it did nothing for me. Too make matters worse, those damn communication stones came into play again (though they were employed in an interesting form of kidnapping). Also, by the end of the episode, the folks at Stargate Command really came off looking like jackasses. "We thought that if we broke into your facility, kidnapped some people, and demonstrated that the experiment was safe, you wouldn't mind!" You'd think that the Stargate folks would have done a bit more research and made sure that their allies were not betraying them before... well... betraying them. Back on Destiny, Dr. Perry and Dr. Rush find a way to get it on by uploading Nick's consciousness into the ship's mainframe. There weren't really many surprises with this plot thread. Amanda couldn't let Rush go, so she continued a charade that had him thinking that he had returned to the real world. My eyes glazed over when Amanda got upset about how this all proved that Nick wasn't really in love with her. Whatever. The fallout of Amanda and Nick's experiment resulted in her and Ginn being quarantined on the mainframe. Eli said it was the only way to save Rush. Now they both can't see their girlfriends, even in holographic form. We also got a few scenes about Greer trying to move about despite a severe infection after he donated a kidney to Volker. This didn't really amount to anything and thankfully was a brief plot thread.